This annual event has quickly become a fun, fast, family-oriented Spring Classic. 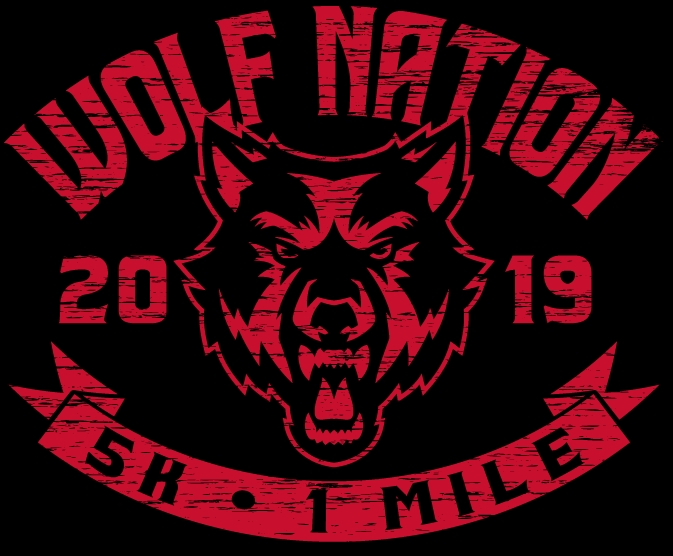 Thank you for considering participation in the 2019 Wolf Nation 5K and/or 1 Mile Run to benefit the Rome High School boys & girls Cross Country and Track & Field teams. This year's race will be held on Saturday, April 27 at Rome High School, in Rome, GA. Cost is $25 per runner for the 5K if you register prior to 10:00 PM on Sunday, April 21st, and $35 Day of the Race. The course is relatively flat and quite fast and will once again be professionally, electronically-chip timed by Wire2Wire Running! For the 1 Mile run, the cost is $10 Per runner prior to 10:00 PM Sunday, April 21st, and $15 Day of the Race. BOTH events come with the awesome Wolf Nation T-Shirt!! NOTE: Pre-Race Deadline (to ensure T-shirt size) closes at 10:00 PM, on Sunday April 21st. Race Day registration will take place beginning at 6:00 AM at Rome High School on Saturday, April 27th. The Wolf Club 1 Mile Run/Walk is open to all ages, however, awards will be geared to the younger participants. 1 Mile Awards will be given on race day to the 1st, 2nd, and 3rd. place finishers for ages 4-6, 7-8, 9-10, & 11-12. Standard Age Group Category winners will apply to the 5K!